A chilly winter day means lunch behind plastic. This is Le Lido seafood restaurant at Place aux Herbes. Pour déjeuner pendant les froides journées d'hiver, on s'abrite derrière des parois en plastique . Il s'agit d'un restaurant de fruits de mer, Le Lido sur la Place aux Herbes. Fun; rather like an impressionist painting. Chuck is right about the plastic muting the colors... love that red tablecloth and the everyday look to this café scene. At least it is only the windows that are plastic in appearance, and not the food (or the plates and utensils). Oh, at first I thought they were sitting in a smoking area somewhere! Awful!!! So it's good to read that it's plastic only. Now on the second view it's clear! How nice to still be able to be sitting outside!!! Here you would freeze to the seat!! It still looks chilly. Some at the table have their coats on, some not. Will their fish remain warm enough to enjoy the whole meal? 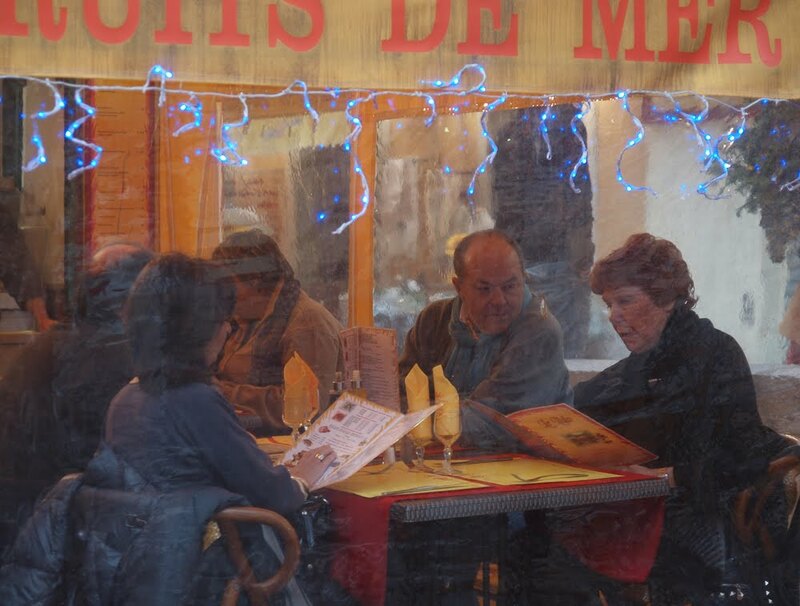 Thick mil plastic, heaters, dining al fresco in winter. Very cool. Would that be [Restaurant De Poisson Et] Fruits De Mer? Anyway, a fine shot. Seven degrees here too, and we have lots of restaurants with outdoor dining areas, but none put up plastic sheeting like this ... it would be fun, too bad. My first thought - it was an impressionist painting. Interesting photo.....a unique photo. On the moody blues, my first impression there was a piano instead of a bench -- agreed with Bob. Jilly I'll agree with the crowd, this photo is truly remarkable in that it gives the feeling it's an impressionist painting.